Imagine looking forward to the cold and dark of winter. Pulling out your favorite soup recipes and a pile of cozy sweaters. Lighting candles around the house and inviting friends over for sledding and board games. When we put it like that, six months of dark and cold seems almost …. pleasant. 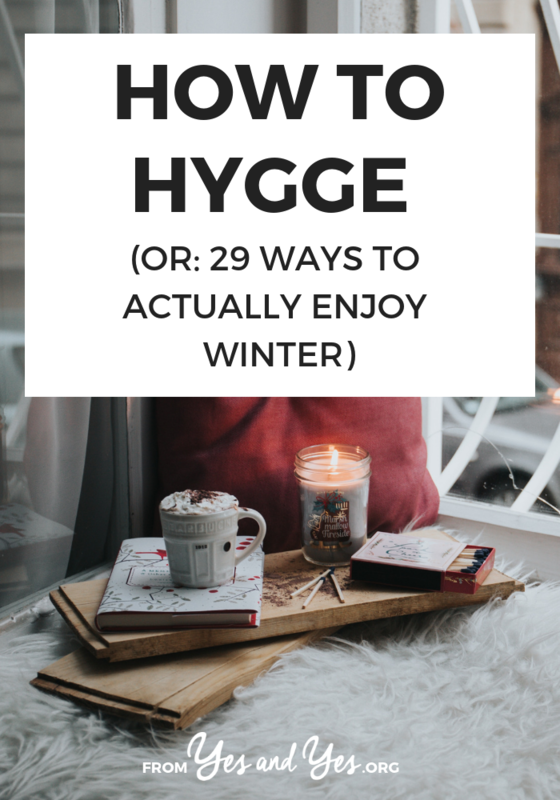 If you’ve never heard of hygge before, it’s the Danish concept of warm coziness during the winter months. It’s “creating a warm atmosphere and enjoying the good things in life with good people” (according to Denmark’s official tourism website.) Those Danes actually enjoy winter! They embrace it and look forward to it! Whaaaaatttt?!! And as a third-generation Minnesotan of Scandinavian descent, I know a thing (or 29) about winter. I know how to cozy down and warm up. So if you, too, are looking for a more social, more enjoyable winter – this post is for you. Bookmark it for the coming months when the excitement of the holidays has worn off and now it’s just cold and dark and dreary. Pour yourself something warm, settle in, and have a read. In addition to championship level cheese-eating and Thriller-dancing, I like to think that I’m a pretty good gift giver. I am totally the friend who makes note of the salt and pepper shakers you liked so much at that restaurant, finds a pair and then gives them to you for your birthday three years later. The truly awesome gift does not come off of Christmas Wish List. It’s the thing that your friend mentioned in passing several times or that you always see them fawning over when you’re out shopping. It’s the sort of thing that they mention liking but can’t justify purchasing when there are bills to be paid and cars that need repairs. It’s the sort of thing that you know will bring them joy. But I’m sure you already know this, right? Riiiiight? Waiting to shop until it’s holiday season is wicked stressful. Wading through seas of women in cat sweatshirts? Not how I want to spend my winter weekends. So if gift giving inspiration strikes you in August, buy the gift then, for Pete’s sake! If you’re on a summer road trip and your friend is coveting some turquoise in New Mexico, buy the necklace and stash it till Christmas. Aren’t you the clever one? Now, I’m not one to sneeze in the face of pillar candles or a basket of scented bath things, buuuuut I also wouldn’t shriek “Wow! You know me so well!” to the giver of these gifts. Give the people in your life something that shows them you know who they are and what they’re about. An aerial map of a city where they used to live or an artist’s sketch of their childhood home. Or what about one of those custom-made photo albums that have the photos printed on the page? Or Indian cooking classes for your friend who spent a year in Mumbai? Or tickets to a reading with their favorite author? I know it’s incredibly tempting to give your lovely but fashion-challenged cousin a gift card to Forever 21. Or give your technologically backwards grandma a digital camera. Gift giving isn't about you and the life you think these people are missing. Click To Tweet It’s about giving them something that they want, something that will make them happy. So you best not be buying me a GHD or a rolling suitcase because they will gather dust and lead me to question our friendship. And I’m pretty sure she was more touched by my $6 worth of presents than the various picture frames/gift cards/novelty socks that she got. At least that’s what I’m telling myself. If you are attempting to give a gift to someone over the age of 26 who has a ‘real job,’ there’s a pretty good chance that if they want something? They just buy it. And really, who needs another decorative bowl/set of cuff links/DVD? Non-stuff is more memorable and it doesn’t need dusting. 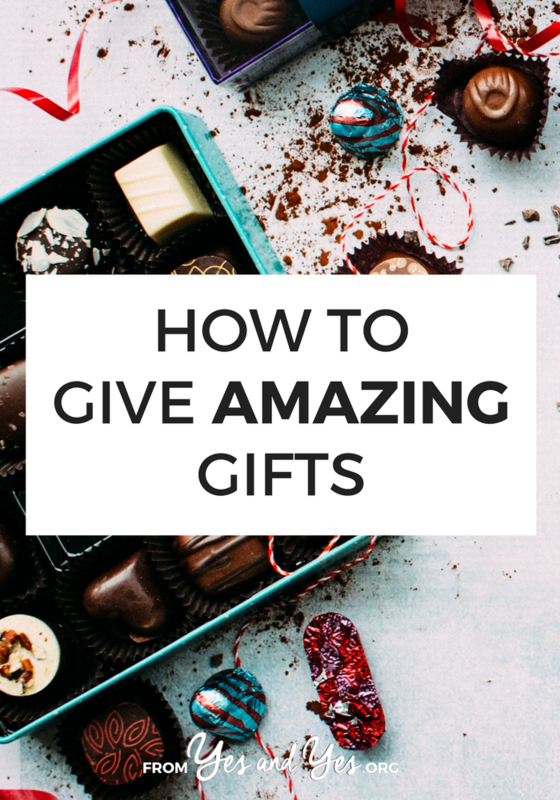 Good non-stuff gifts include airplane tickets, gift certificates for spa services, a night at a Bed and Breakfast, classes or lessons, tickets to a sporting event or concert or donating to a cause that’s important to them. Added bonus: easy to wrap! Do you consider yourself a good gift giver? If you are, tell us your best gift-giving tips so we can learn from you! 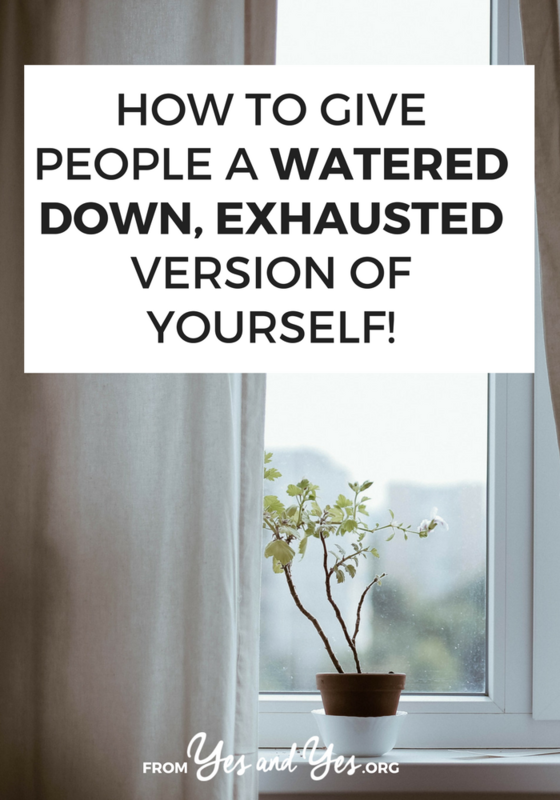 How To Give People A Watered Down, Exhausted Version Of Yourself! For years, the question that ran in a loop through my brain was “Why am I so tired?” In those exhausting years, before blogging was even a proverbial twinkle in my eye, I was an ESL teacher.And I looooooved it. I was that teacher who came early and stayed late and brought in themed snacks to match the books we were reading. I sang songs about colors with exaggerated gestures and those facial expressions unique to teachers who are trying to get people to sing along. You can easily spend every evening and weekend poring over the curriculum, planning new units, fussing with bulletin boards. And I frequently did. Slowly but surely, like so many teachers before me, I started to burn out. I’d check my email while my students practiced their keyboarding skills. I’d assign “silent reading” while I silently read my most recent issue of Real Simple. This wasn’t who I wanted to be! Disappointed and overwhelmed, I called a huddle with my veteran teacher parents. I was hoping for some time management tips or a pep talk that would return me to my high-energy, super-engaged self. But what they told me was a lot more realistic and a lot more useful. This applies to just about every area of our lives, doesn’t it? When we have eight social commitments each week, it’s difficult to really be there for our BFF when she’s blindsided by a breakup. When we take on a zillion projects at work, it’s hard to give our passion projects the attention they deserve. When we post seven times a week, it’s hard to create the meaningful, longer pieces we’re really proud of. Being exhausted and overwhelmed serves no one. You deserve to actually enjoy your job and relationships; they deserve the best you have to offer. Are you guilty of taking on too much and then doing a less-than-amazing job on all of it? Where could you cut back? If you’ve stopped overdoing it – what did you stop doing? 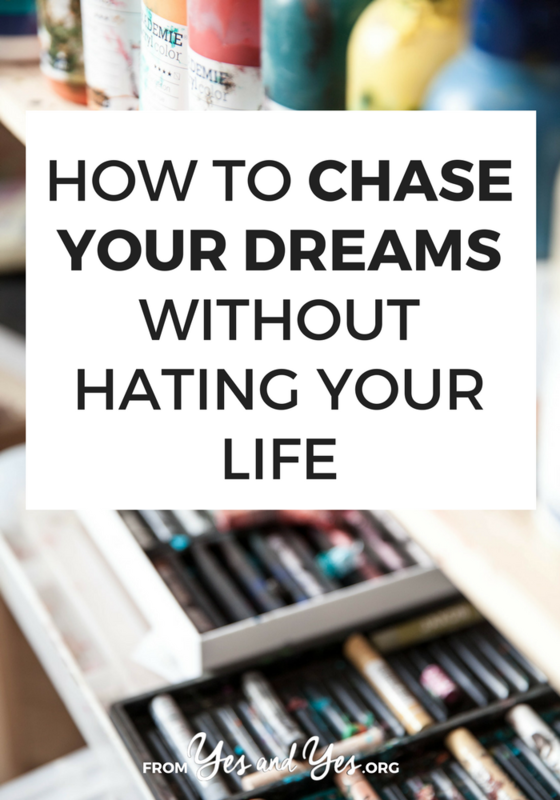 This guest post come from our DIY/design contributor Thalita of The Learner Observer. Thalita writes about easy, cheap ways we can all make our small, rental spaces even cuter. Follow along with her on Twitter or Instagram! Hello again! I’m back this month to share something near and dear to my heart – creating an entryway when you have none to speak of. Yes, my friends, I share your pain. I happen to have a makeshift hallway as an “entry” and if more than one person is standing in it, we have a major traffic jam. So let’s see what some of your best solutions might be if you suffer from this major first world problem! Yes, I am serious. If you have such a small space that furniture isn’t even an option, get real creating and paint some on your walls. Of course, add in some real elements with it (like the hooks and shelving here). And if the modern look isn’t your thing, go more traditional with a painted console table – though there are bigger pieces of furniture here, you can see the potential for a smaller space. It’s true. You can sit on them, you can put things on them, and some of them even look damn good in the process! Opt for thin ones if you have a narrow hallway space like mine, or go for something deeper but narrower if you only have a small corner of space to work with. For Pete’s sake, don’t forget to make use of the space under your BFF – the bench, of course. Use baskets, boot trays, or just throw your stuff under it. Either way, use the space! The last image is also a great example of this. Line up some inexpensive hooks and make yourself a mini mudroom of sorts. And the image below also uses benches extremely well. Hooks and benches are kind of a killer combo for an entryway. Your guests will thank you and you won’t have to awkwardly hang people’s coats on the stair banister anymore. Even if your space is teeny tiny like this one, hooks are probably my number 1 thing on the list of things you need in a small entryway. Or any entryway, really. So convenient! I’m bringing back the word ‘nifty’. It’s happening. It’s so the next “fetch.” Show storage like this is really just dreamy. These definitely do double duty as storage and as a surface for catching your keys and sunglasses. Go a little crazy (as if painting your entryway on wasn’t crazy enough) and try some different things, like some old crates that you can change up whenever you want! And if you happen to have a larger space to work with, and maybe it’s just a little awkward, give yourself some storage by using a dresser – yes, a dresser – as a console table, and rethink the rectangular mirror and opt for something that doubles as artwork. Did you notice almost every single image I showed you had hooks? I’m telling you, once you put some up on your walls, you’ll never want to go back to throwing your coat on the first piece of furniture you see or going down the hall/into the next room to hang up your things! I hope you found this useful, and maybe even a little entertaining? 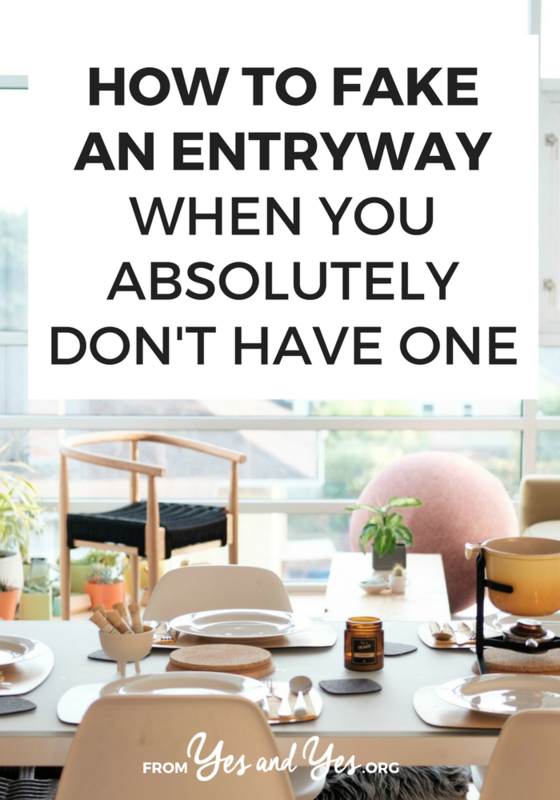 Have you created an entry way out of nothing? 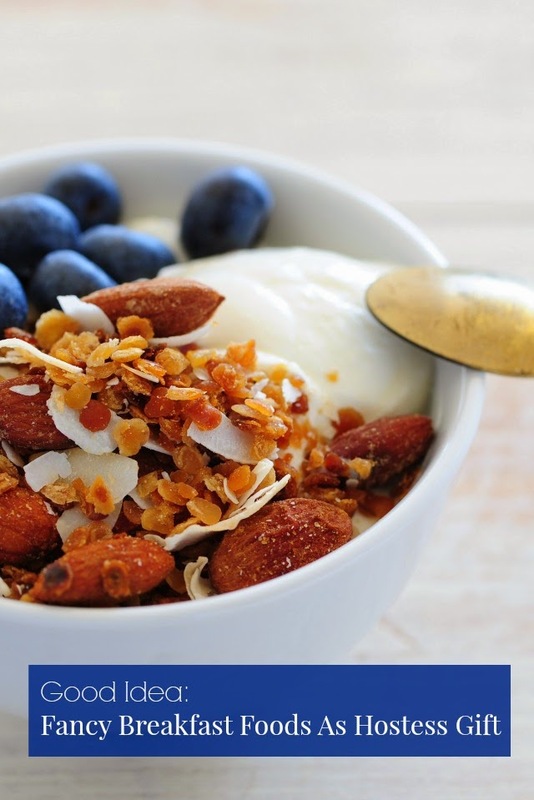 Share your tips in the comments!